- - Do I look like a clown? - - Yes, but in a good way. - - What do you mean? - - Like a cute and stylish one. Many years ago I fell in love with Alice Starmore’s designs. To be exact, it wasn’t so much love as admiration and awe. Never before could I even imagine using so many different colors while creating one garment. And the end result – oh, where to find words to describe it! It was like a painting or a tapestry, work of art – unique and priceless. The models looked stunning with mountains, lakes, or colorful fields as background. The steeks and knitting in the round without seams were well explained and seemed easy to implement. I started collecting Alice Starmore’s books and bought yarn in all possible colors. I didn’t order the original yarn since it was either discontinued or too expensive for me, so I had to settle for something much cheaper. And then the fun began. I made several Starmore’s designs religiously following all her directions with steeks and yarn cutting. The finished projects looked pretty and unique but, unfortunately, I didn’t look pretty in them. Rather the opposite. They were too large, long, and oversized. I looked awful – like a shapeless midget with no legs, waist, or shoulders. Plus, they were very hard to wear – imagine wearing a tapestry or painting to a supermarket or class. They were not versatile garments at all. I gave away or donated almost all of them but one, which is still collecting dust in my closet but is never worn. After that I started wondering why my knits didn’t look on me like on the models in Starmore’s books. At first, I blamed the yarn. I promised myself to splurge on well made English yarn as soon as I get a well-paid job (never happened, because as soon as I got a job I almost didn’t have time for knitting). Then, a couple of top-down seamless garments that didn’t fit later, it dawned on me that maybe the reason was the construction itself. Seamless top-down sweaters, so popular now with Ravelry knitters, don’t look well on me. To get a good fit I need seams and structure. Otherwise, knit fabric just hugs my body at every protruding point in a very unflattering way. And it stretches a lot with wearing and washing. More it stretches, more shapeless and unflattering it becomes. Until one day I just bite the bullet and unravel it. Only you cannot unravel a multicolored concoction with steeks – remember, the yarn was cut. That is why for a while I didn’t do fair isle at all, or, occasionally, I would make a hat, scarf, or gloves (you can find great design for small fair isle projects), or even a vest (this one was made in pieces, without steeks, didn’t stretch, and is still wearable). This year in Florida, surrounded by bright, cheerful colors, my appetite for color work was reawakened. After making Juno and getting many colorful balls of Rowan Pure Wool 4ply, I wanted to try my hand in creating something unique and special. Yet, this time I wanted it to be wearable and well fitting. Which meant no knitting in the round or steeks. And the rest is history, as they say. 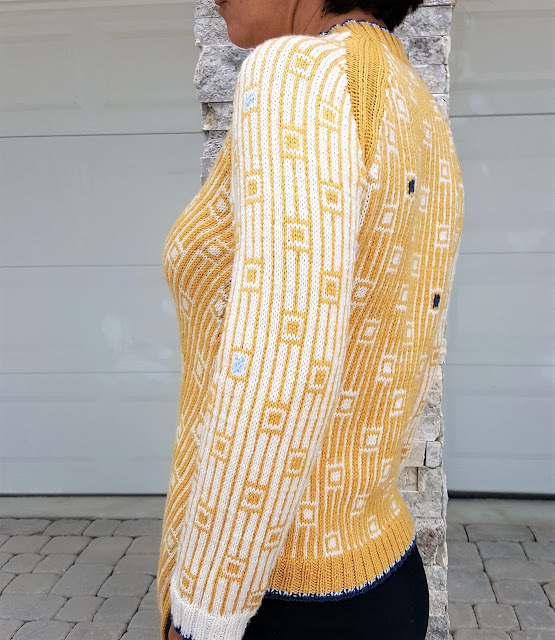 I was happily finishing my yellow and white asymmetrical sweater when one day, coming from my daily walk, I looked at the sweater’s parts laying on the couch and got rooted to the spot: What was I thinking?!!!! Yes, I managed to make a whole sweater with only 5 balls of Rowan Pure Wool 4ply in yellow, but I definitely won’t be able to wear it any time soon. If ever. Where would you wear something like this? Surprisingly enough, I got an unexpected encouragement and support from my husband, who usually doesn’t even notice what I am wearing. He is not into clothes or fashion, to put it mildly. Yet, this time he stopped and said: “Look, this one fits you really well! Congrats!” I blame the yellow – it is extremely noticeable. Anyway, I decided to keep it for now (my first impulse was to send it to my daughter in New York), but switch to making more traditional stuff in less conspicuous color. See what I mean? Something versatile, that I can wear anytime anywhere.